After four weeks of demonstrations, blockades, occupations, general meetings, analysis of all kinds, here is one with a radical left and/or anarchist angle. Sorry to all those who are still in complete denial but the Yellow Vests, in good multiples forms movement, shelter at worst the far right and at best nationalist confusionism. And that’s normal, we are in a racist, homophobic, virile country. A national movement, poorly politically formed , and assembled on the basis of an aggregation of anger is likely to resemble the ideology that shaped our political consciences (or our lack of consciousness). It is this lower middle class, made up of many workers and salaried workers, rural and peri-urban whites, which crystallizes the political confusion. This, moreover, deeply annoys those who would like to see in this movement the emancipated proletariat which, once capitalism has fallen, will magically abandon its racism, its nationalism, its virilism, and so on. A rather strong rejection of all attempts at political recuperation, with rare locally exceptions. Claims finally out of the initial tax treaty, still spreading, quite disparate from one place to another, and often until the total rejection of the political system and not only Macron. Modalities of action which emancipate themselves finally from the places without interest which are the roundabouts, except to communicate summarily with many passers-by. An increasingly massive refusal of any “political representation”, whatever it may be, refusal still very vague in its consequences, without historical or ideological reference, but letting appear a desire still nascent and obviously hesitant to cross the rubicon of direct democracy. And here we are, somehow obliged to participate in one way or another to this movement which even if it is still very weak and too permeable to Poujadism in terms of massification (it will be recalled that ” 250 000 demonstrators throughout France, it is considered a defeat during a trade union mobilization, and even here they do not even strike. “), has the merit to exist socially so much so that it s takes a non-negligible part of the collective and symbolic imagination in the social struggle. Indeed, since the beginning of this movement, there has been an internal struggle between a militant group trying, both on the internet and on the barricades, to assert an identity and anti-migrant line (playing especially with intoxicants or the theory of “the great replacement” and launching patriotic slogans or singing the Marseillaise), and a much more left tendency that tries to replace the claims of said movement with a criticism of liberal capitalism as well as in an inclusive logic of oppressed minorities. The latter is gaining more and more ground as the extreme right struggles to propose concrete solutions to police repression, alternatives consistent with capitalism and effective modes of organization in the fight; that on the contrary, the extreme left is quite able to bring the Yellow Vests. To this we can add that the balance of power in the street is clearly in favor of the anti-fascism that targets the fascist activists to make them flee the protests. But naive will be the one who will explain to us that the movement is now progressive on the pretext that he would have been joined by the “committee for Adama” ( support committee of the family who lost Adama under police violence and became a larger group against police repression ) or LGBTQIA+ militant and authors. For this movement to which everyone tries to bring the good word has nevertheless succeeded in expressing something fundamental: it refuses the idea of ​​representation globally. It refuses anyone to speak on its behalf whether to negotiate a truce or to make demands. And in this it is ultimately deeply anti-reformist. Let’s even dare: profoundly revolutionary (for good or bad). In the same way, think that it is the proletariat (and only it) who is actually in the street, categorizing any criticism of the movement in the camp of class contempt , is wrong. A multiple forms movement inevitably produces discourses, methods of struggle and contradictory claims. Do not recognize it, do not accept it is already a little recovery and fall into the trap of confusion. This same movement seems to claim less money than dignity. AND THE ANTI CAPITALISTS IN ALL THIS? It is now obvious that, given the media exposure, the fierce repression, the fear and contempt it inspires to bourgeois, it would be ill advised to ignore the Yellow Vest movement any longer. Especially since we talk about “movement” since the beginning of this article it’s good that we are in a dynamic, that things move, that the lines are moving. These people do not argue, do not want to sit around a table. They rise up. And the uprising is what we want no? Political self-determination, anger turned into a desire to further disorder. Apparently this is not the case for everyone in the extreme left. Some still prefer to parade at the head of procession under trade union or party flags. Not much moved by the fierce repression of those who are no longer satisfied with a lukewarm march from point A to point B, framed by the prefecture. What is being played here is also two visions of reversal that clash. A certain left speaks to us of national revolution, massive, quasi-spontaneous in which one must rush to make the best of it. Do not hide it, this left is authoritarian. It does not need to be in political alignment with those who share the uprising: it will purge them later. Yet the strength of the Yellow Vest movement is that it disconcerts everyone, both the seasoned activist and the police force. They gas all the way to divide the procession? Never mind, there will be 2, 3, 4 processions, each with its inflamed barricades (what happened in Toulouse last Saturday). They confiscate the protective equipment to dissuade to go to protest? Okay, but there will be street doctor teams more determined than ever and poignant solidarity testimonies. The police killed, it mutilated, it humiliated … it tried to maintain order but only pushed to radicalization, showing the extent of its violence and by the same the extent of its inability to join the a movement gradually silencing the slogans “the police with us” that soon give way to “everyone hates the police”. The counter-attack is organized therefore, the plans of repression leak on the internet, as well as their personal addresses. And while, driven by ever more militarized repressive techniques, yellow vests are gradually forming anti-repression strategies provided by the radical left. In short, the police militarise, we organize. Unaccustomed to this logic of generalized “craziness”, the police tramples and that’s good. Far from believing that this neo-Poujadism will magically disappear in contact with the left-wing activists, the rioters will emancipate themselves from the figures who built them throughout their education (the French Revolution, the sovereign people, the value of work, the defense of the territory etc.) the context has forced us all to join them on the barricades. Because it is this context that has allowed the blocking of high schools, the mobilization of drivers or paramedics and more generally the mobilization that spreads in the General Assembly in universities, or simply on the internet. It is finally the same context, in all its anti-police violence which is gradually pulling back the government which grants for the moment only crumbs of victory, but which for its greatest misfortune, and for our greatest happiness, is not addressed to reasonable interlocutors. So yes this choice that it was very dangerous to do in the aftermath of November 17 has become necessary, see salutary for an activist anti-fascist (who will track the fascists in the demo), anti-capitalist (which will counter citizenism in the General Assembly) ), anti-racist and anti-sexist (who will build inclusion through non-mixed gatherings). Because for the moment, the analysis of the white Peripheral France that rises against the oligarchy globalist acts as electoral boulevard for Le Pen. It’s up to us to change that. 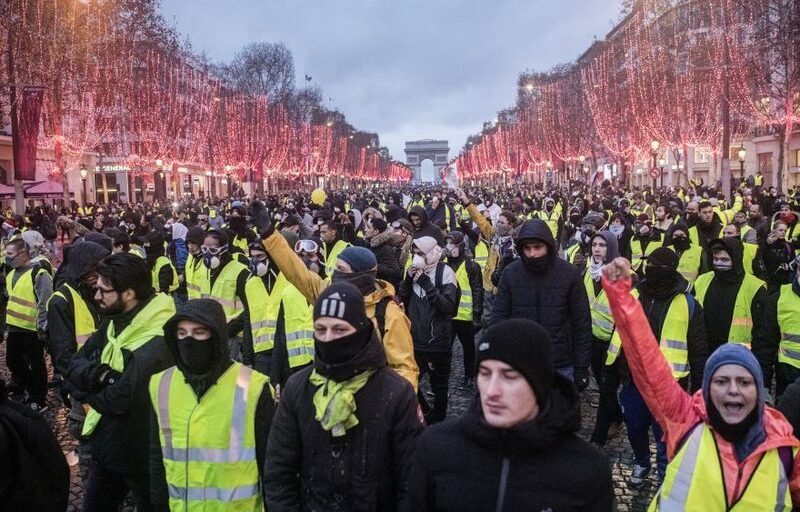 Pingback: An Anarchist’s Perspective of the #YellowVests – Enough is Enough!